Are you a food blog junkie? Do you stop your friends from eating your culinary creations before they’ve been thoroughly photographed? Do you wake up and check your feed for new posts from your fave food blogs? Most importantly, have you made online foodie friends? If you’ve answered yes to these questions, it must come at no surprise that you’re a foodie. Last week, Diane and Todd from White on Rice Couple sent me the best graduation gift a foodie could ever ask for. It was a care package filled with a bottle of epicurean extra virgin olive oil, a hand-crafted wooden serving platter, exquisite dark chocolates, Vietnamese goodies and pretty party napkins that made for excellent shock absorbers during delivery. 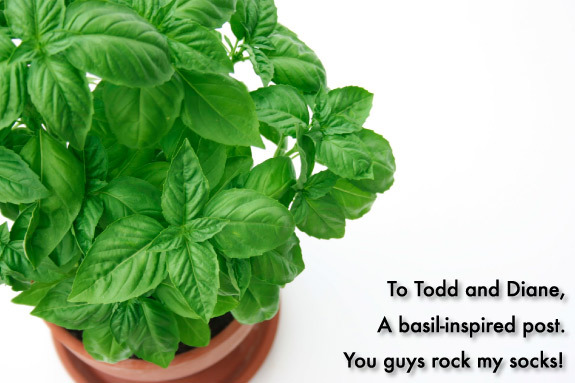 The gift also came right after they inspired me to plant my own herb garden (READ: 1 basil and 1 rosemary plant). This week, as you can tell, my basil plant is out of control. I pluck and it just keeps growing! So to show my thanks, I’ve decided to write a post using my homegrown basil and a couple of their gifts. When I opened the bottle of extra virgin olive oil they sent, I was immediately taken aback by its bold fragrance. It was like sticking my nose up close into a big bowl of Mediterranean olives. This kind of oil is certainly not meant to go anywhere near heat and is perfect for salads and dunking bread. I opted for the latter choice, and went with a warm baguette from my local baker. Infused oils is something my mom always makes for when guests are coming over. It’s extremely simple and tastes even better when made a day in advance. 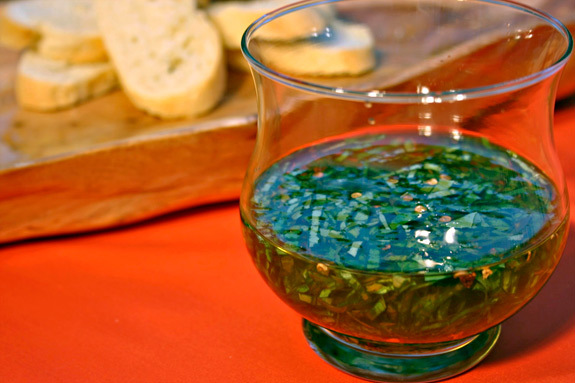 This recipe is for a spicy basil-infused olive oil and it is by far my favorite variation from my mom’s collection. The oil is out-of-this-world! 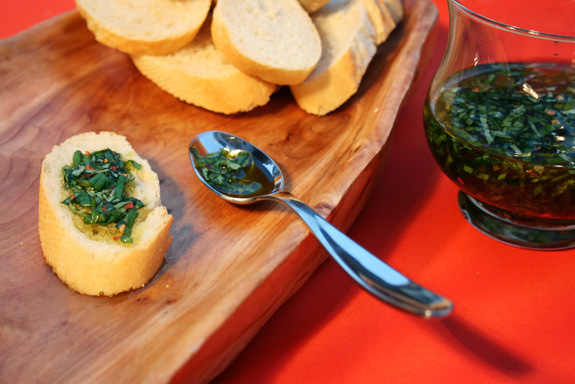 The minty subtleties from the basil play really well against the robust flavors of the unfiltered olive oil. 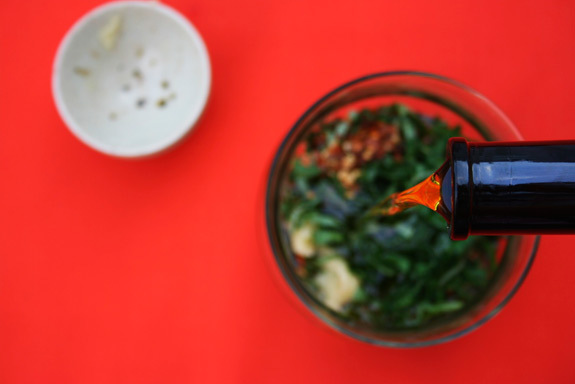 After the oil has had about a day to rest (overnight if you’re too impatient), there’s probably not much that wouldn’t taste amazing with a little drizzle of this concoction. Seriously, drizzle this over some grilled chicken, spread some inside your sandwiches, heck, go at it with a spoon? OK, maybe that’s a bit much, but that’s not to take away any of its awesomeness. Thanks again, D & T for the amazing gifts! I’m looking forward to using the rest of the oil and the other treats you guys included. The chocolates were gone by the second day, but that was to be expected. You guys are the best!! In a pretty container, combine basil, red pepper flakes, garlic, salt & pepper and cover with the oil. Cover with plastic wrap and allow the oil to sit over night. Serve with bread (or anything, really) and enjoy. Note: You can store the oil in the refrigerator, but make sure to bring it back to room temperature before using again. It is normal for the oil to congeal in the fridge. Posted in appetizers, Italian, recipe, savory by Antonio Tahhan on July 19th, 2008. You can follow any responses to this entry through the RSS 2.0 feed. You can leave a response, or trackback from your own site. The photos are crisp, gorgeous…as always. You make everything look so delicious and artful! Amazing. BTW, I’ve given you an award. Check it out here! Just found you though Peter’s blog. 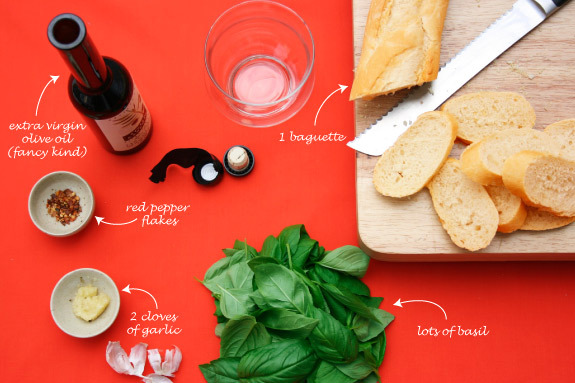 Gorgeous photos, I love the mise en place. Looking forward to reading more! Beautiful photos and thanks for the infused oil recipe! I have some basil from my parents garden and I think we will make this ourselves!! Have you ever made you own vanilla extract?? I’m considering doing that very soon (just need to buy the vodka). I want a foodie gift like that! You’ve got a beautiful blog yourself. Thanks for dropping by Twenty Something. I’ve started working on my own website, so have a look there too ok? Diane & Todd are the best, aren’t they!! they sure do rock. Anything basil is good for me. I love that stuff! And even better in oil! Good for you! We could send you a bag of snickers and you would still make them look beautiful! Your photography is unique and amazing Tony, you are a talent. Gosh, thanks for the shout out, we’re blushing right now, we didn’t expect this much love. We’re just proud of you for your accomplishments in school and your blog. The infusion is amazing, we can smell it over here, all the way on the West Coast! I bet it’s the beautiful garden basil that perfumes the dish! That looks wonderful. I love your blog! That olive oil must be very fragrant and tasty! Delicious! You have a great blog! Your blog looks great! I have always wanted to try making infused oils, but now I am going to have to try it soon! 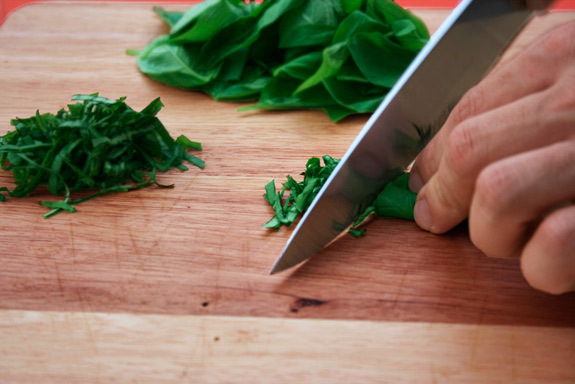 Love your mise en place pics…but I a repeating myself! Great gift and great way to use it!! Wow – sounds like an awesome care package. I really need to get into one of these exchanges. My basil is pretty lackluster :(. What’s your secret? Man, that looks good. There’s nothing like homegrown basil and fancy olive oil. Yum! What a great idea. I love the idea of basil confetti. So adorable.